Practically everyone loves baby goats! They are playful, cute and bounce around with such a lust for life that it’s hard not to smile watching them. 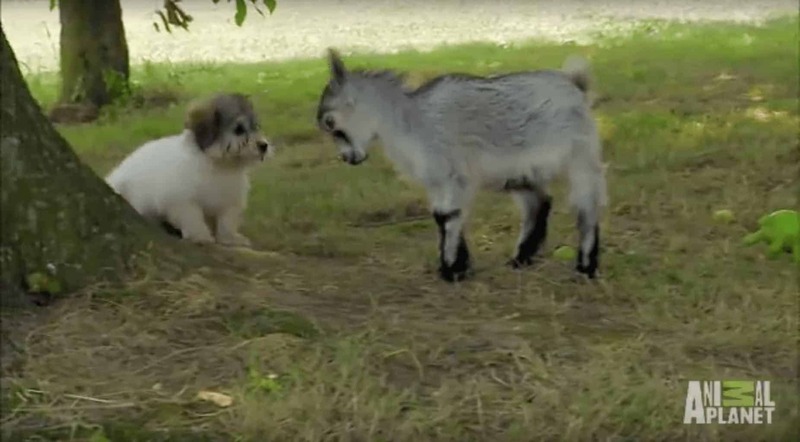 The video features Pipsqueak, a tiny pygmy goat, and a bunch of white, furry puppies. They all live together on a farm together. Pipsqueak just wants to be friend with everyone she meets but just sometimes it can take a little while for her to break the ice. In the video, she can be seen trying to make friends with a group of puppies. She follows them around and just wants to play too. Unfortunately what she doesn’t understand is that they’re not a goat like she is, they don’t enjoy bumping heads. Heartbreakingly the puppies begin to leave her out of their games and just play with one another. Which clearly left her feeling sad. Snowflake, who is the shiest of all the puppies, spots Pipsqueak looking sad and makes an effort to see through their differences looks and the head bumps and offers her hand in friendship. Clearly absolutely delighted with her new friend, the goat excitedly plays with Snowflake, who merrily chases her new found sister all around the grass. Watching Pipsqueak and Snowflake having so much fun now the other puppies want in, which makes for the cuties scenes as they all romp around on the grass with jumps of delight periodically from Pipsqueak. There is a lesson for us humans in here, the puppies did as humans often do and prejudged Pipsqueak, however, Snowflake was different, she saw through their differences and as a result brought everyone together. We would love to hear what you thought of this story in the comments? If you’ve enjoyed this uplifting story, please ‘LIKE’ and ‘SHARE’ with your friends.